Admor HVAC has opened a new 2,500 sq. ft. State-of-the-Art “Hands On” Fujitsu Ductless and VRF Training Center at our warehouse on Waiakamilo Road. The center features fully operational Single and Three Phase Fujitsu VRF, Single and Multi-zone systems with wall, floor, ceiling, cassette and ducted fan coils. Technical training classes began in April 2016 with Fujitsu VRF Certification courses. In May 2016, the Training Center will be featuring Fujitsu Electronic Diagnostic and Tear Down classes for HVAC installers and technicians. All classes are free to licensed contractors and engineers. Instructors include factory engineers and representatives from America’s leading HVAC companies. This Training Center represents an investment in Hawaii contractors and provides us the opportunity to provide “hands on” technical training on the more complex VRF and multi-zone systems. We strongly believe that “training” is an important part of our mission and goal to provide the highest level of service before, during and after the sale. Investing in our customers and the HVAC Industry is important to Admor HVAC. Over the years, we have conducted more training classes than all of our competitors combined. It is safe to say that almost every air conditioning contractor in the State of Hawaii has attended one or more of our training events. 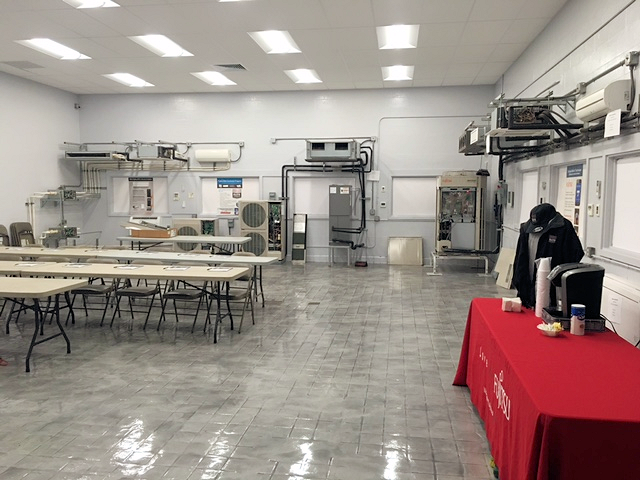 Our Training Center in Honolulu is home to Hawaii’s first “Hands On” classroom dedicated to Fujitsu Ductless Split and Maytag IQ Drive Air Conditioning. Actual operating equipment is installed so that installation and service technicians can learn proper installation techniques, trouble-shooting, repair and maintenance. All of our systems operate in real life conditions. During trouble-shooting classes, we will bug each system so they are inoperable and then take the contractors through proper diagnosis and techniques to repair the system. Hands On classes are limited to 9 students per class so that we may spend quality time with each participant. Admor HVAC’s Hands On Training Center includes an operating Maytag 24 SEER IQ Drive Air Conditioning System with Zoning. Condensing Unit, Air Handler, Zone Dampers and Thermostat are all operable so that contractors can learn proper installation techniques, trouble-shooting and service. Individual instruction on programming the IQ Drive Thermostat is provided along with detailed instruction on operation and trouble-shooting of electronic circuit boards. Our new VRF Training Center is now open. We have installed a complete Fujitsu AirStage three phase VRF system complete with outdoor condensing unit and indoor fan coils. Wall Mount, Ceiling Cassette, Slim Duct, Standard Duct and High Static Duct air handlers are all installed and operational. Classes include both classroom and Hands On training that includes instruction on the Fujitsu Design Simulator, System Controller, Service Tool and Web Monitoring.